Joel's Jottings: Shrek the Third - Delightful or Dull? 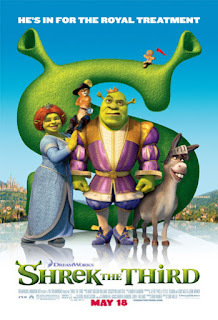 Just came home after watching the movie, 'Shrek the Third' along with my kids and my friend's kid, at the Seef Megaplex. I had earlier enjoyed watching 'Shrek' and 'Shrek 2' - well, you'd be watching these type of movies too, if you have kids in the age-groups as those of mine - but somehow I feel that this part is not as good as the first and second. It was delightful in a way, with all the fairy tale characters together - from Cinderella to Gingerbread Man, from Pinocchio to Rumpelstiltskin. But somehow, I felt the focus shifted away a bit from the antics of the Donkey or Puss in Boots - who I think are the life-blood of the Shrek series. And Shrek and Princess Fiona too get less screen-time. Well, even though my favourite character from this edition is Merlin the wizard, [despite his brief presence...oh..by the way he is dressed briefly too! ], the overall impact of the movie wasn't as high as I anticipated. But then, its also possible because the media raises our expectations, with all that marketing imagery. But seeing the repetition of scenes and locales, again and again, can slowly bore you in sequels. See how you feel your interest waning as you watch The Matrix and then The Matrix Reloaded and then the Matrix Revolutions? Or Jaws series or Scream series. Even Superman and The Lord of the Rings and the Pirates of the Caribbean can make you lose that wonderful first love for the first film. I know there will be some who'd say, this is rubbish. And even point a case that the Lord of the Rings' third part actually won 11 Oscars. But I still feel that winning academy awards gives no evidence or proof that the enjoyment is same, or more than, when watching the first one that preceded the sequels. So, here's my Law. Joel's Law of Movie Sequels. "In movie sequels, all things being constant - such as characters, dialogues and music - the degree of excitement one perceives watching a sequel is inversely proportional to the number of the sequel!" Hee hee. My own postulate. A Royalty-free quote. But please give my reference, every time you use it. Uh ho..... . I must run away now. I'll continue this later.